Having done quite well in maths but bad in writing, do you feel annoyed? Having been looking for proper learning materials for so long time but without a satisfactory result, do you feel anxious? Having had seas of writing exercises but still no obvious progress, do you feel helpless? Now you can prepare your SAT essay writing anytime anywhere, as long as you take your iPhone or iPod touch. 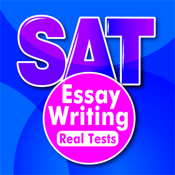 The “SAT Essay Writing” is a perfect tool for you to prepare your SAT writing, which is written by a Chinese-American teacher who has got full marks in SAT writing. With the the rich experience of SAT teaching, he knows well of the common writing problems SAT candidates encounter. This part provides you with previous years' writing questions and authentic sample essays, helping you to figure out the testing pattern and secrets of writing out a good essay. Please check the following for more specific features. - 49 SAT real writing questions between years 2005-2010. - The corresponding sample essays are all well-organized, well developed, fluent, coherent and authentic in language. - Support live writing practice in writing mode. - Ability to save and restore your practice record. - You can compare your own essay with the sample essay provided, which will give you a good chance to get close to the real exams and also learn from the excellent sample essays.